In an effort to bring better quality meat from small family farms to my community, I opened a butcher shop in Chicago called The Butcher & Larder. For eight years I’ve been helping people with everything from Thanksgiving dinner to how to cook a steak. When they’re gazing wistfully at the steaks in the case, customers often say, “I’d really love to cook one of those for myself, but I just don’t know how. 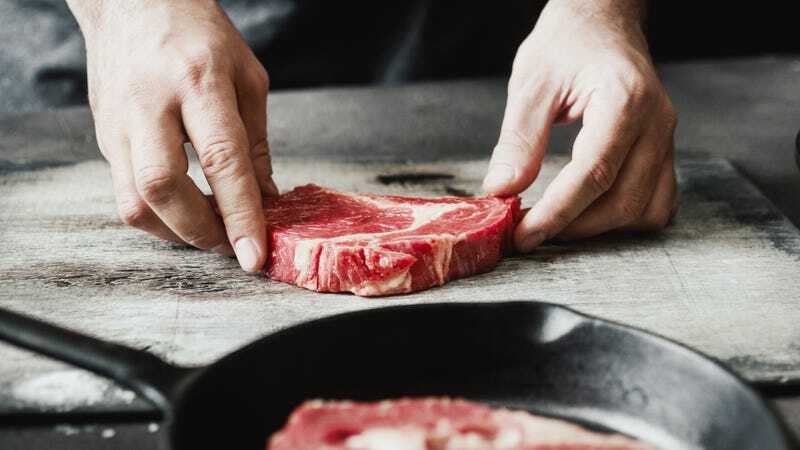 I’ve tried cooking steak at home, but I just ruin them…” In the past, I’d try and dig into their cooking psyche and figure out from where the block stemmed, but these days, I build up their confidence, and then arm them with a simple formula. Before we get to the formula, though, I’d like to bust a few myths about cooking steak (or most meat, for that matter). First: Rid yourself of the notion that high heat is what makes a great steak, or that you need a “rippin’ hot pan” to “seal in the juices.” The pan matters, but the heat less so. Searing a steak is great for flavor. Look up the Maillard reaction to see what I mean in detail, but for brevity’s sake, when it comes to meat, brown = flavor. How you do your browning is key, because while brown is good, gray is bad. Gray is the sad, unintentionally over cooked portion of the interior of the steak. When you sear in, say, “a rippin’ hot pan, bro!” you get great browning on the outside, but just under that sear is a layer of gray that takes away from the steak’s flavor and juiciness. The other myth I’m most asked about—whether steaks should be room temperature before cooking—might seem to make sense, but science says otherwise. It’s not a bad habit, but not totally necessary, either. My method for cooking the average steak (average steak means your basic ½-to-1-inch thick ribeye or New York strip, not a 3-inch Fiorentina or 47-ounce tomahawk-mancave-beast-mode behemoth) is a 16 minute commitment: 1 minute to season, 10 minutes to cook, five minutes to rest. I call it the 3-3-2-2 method as that’s an easy thing to remember if you’re at a butcher counter with nothing to write on, and it results in a perfectly browned, medium-rare steak. Seasoning doesn’t matter. I’m a salt and pepper guy, but if you like Guy Fieri’s Santa Maria steak rub, go for it. Put your heaviest skillet over medium heat (yes, medium—335 degrees or thereabouts Fahrenheit). Cast iron is great, but any heavy pan will do. After a few minutes on the fire, add a couple tablespoons of oil (olive, grapeseed, sunflower, etc) and lay your steak in the pan. Resist the temptation to slide, poke, wiggle, or move the steak. Just leave it there for an agonizing three minutes. Flip and repeat for three more minutes. It will seem like forever, but remember what Tom Petty said, “The waiting is the hardest part.” Flip again, but this time for two minutes and again for another two minutes. Remove your steak from the pan and rest for five minutes. This works because three minutes over medium heat is just enough to get some nice brown on the meat while warming the steak through to the center, but you turn it in time to avoid any of the nasty gray we are trying to avoid. The two-minute cycle continues to brown the surface gently while getting your steak cooked to temperature. If you like your steak a little more done, add a minute or so to the cook time. If you like it closer to well done, add another minute. I wouldn’t suggest any longer, though. The important thing here is that the times have to be even so the steak isn’t more done on one side than the other. Keep the heat modest so everything stays nicely seared and juicy—see? Simple.